Summary: How much does a new toilet cost, average toilet installation costs and average price of a toilet. If you have a reasonable amount of plumbing knowledge and the relevant tools, fitting a toilet yourself can be a realistic option but make sure you know exactly what you're doing before you switch off the water supply and leave your household without essential facilities. It is of paramount importance that you understand the layout of your foul drain system and how to safely tap into it before you start. If you buy a toilet from a DIY store then it will come with installation instructions, so with an added bit of reading up on the web you should be able to install it successfully especially if you choose a simple close coupled design. A completely new installation may require some extra work such as tiling and pipe work so be prepared to get a plumber in for the job if you're even the least bit unsure. As with any dilemma of whether to DIY or not, don't try projects that are beyond your abilities, especially where water is concerned. If you decide to hire a professional to fit your new toilet pick one by reputation as well as price. A handy man can often work out cheaper than a plumber if you need extra bits and pieces done, such as retiling an area from where the old toilet was removed. They may be prepared to include this in with their hourly rate. Ask around your friends, someone always knows a good tradesman, or can recommend one that has done a good job. Many people choose close coupled toilets now a days because they look much tidier as the cistern and pan are bolted together and all the connections go directly through the cistern base. This makes them a realistic DIY installation as the inlet and outlet pipes are sited internally, as is the standpipe, so any overflow goes into the pan and doesn't have to be routed outside. Space saving toilets are ideal for a small bathroom or cloakroom and have the added advantage of a reduced size cistern which in turn uses less water per flush. Some of these can be quite tricky to fit, especially if there is no existing plumbing so it would be worth asking a plumber to do this type of install for you. High level cisterns are found mainly in Victorian properties and you can still get hold of reclaimed ones if you're renovating in the original period style. These are mounted on heavy duty shelves or brackets near the ceiling. They require separate overflows and the couplings are somewhat tricky. Unless you are a really accomplished DIY'er, leave old fashioned toilet installations to the experts. Bathrooms can be an awkward shape to work in and in particular where a toilet is going to be fitted. It is extremely important to have a toilet plumbed in correctly and that the waste is properly installed so that there is no danger of back up in the sewage pipes. Warning signs that there might be a problem include bad smells coming through the pipe work and into the room. 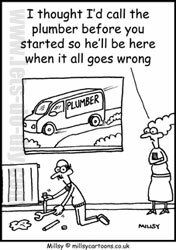 A handy man can often work out cheaper than a plumber if you need extra bits and pieces done. Many people choose close coupled toilets now a days because they look much tidier. You can buy a basic close coupled toilet for about £50. If you have a trade account then you will be able to find them even cheaper. There is almost no limit to what you can pay for a toilet and some of the most expensive luxury ranges run into hundreds of pounds. A low level cistern has traditionally been the standard type of toilet on the market until quite recently and a middle of the range design is about £90. The cistern goes behind and slightly above the pan and a fair amount of knowledge is needed to get the overflow and inlet pipes correctly sited. Budget for about two to three hours for a pro to uncouple the old toilet and plumb a new one into the same area. If you are hiring someone who can do the plumbing as well as any tiling and plastering, then that may be more cost effective if you know there is going to be extra work involved. A general tradesman will charge between £25 and £50 an hour but remember that there may also be a one off call out fee on top of that so get the price up front so you know what to expect on the bill. A specialised plumber will probably charge nearer the £50 an hour rate and homes in large cities tend to attract premium rates as well. Budget for about two to three hours for a pro to uncouple the old toilet and plumb a new one. Remember that there may also be a one off call out fee.